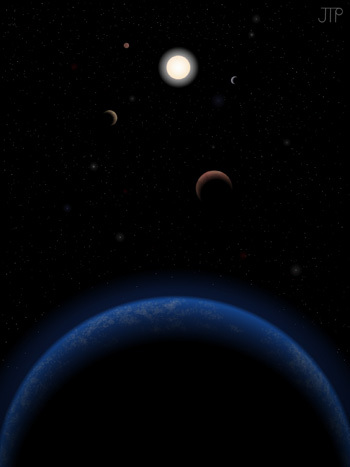 An international team of astronomers has discovered that Tau Ceti, one of the closest and most Sun-like stars, may host five planets, including one in the star's habitable zone. "This discovery is in keeping with our emerging view that virtually every star has planets, and that the galaxy must have many such potentially habitable Earth-sized planets," said coauthor Steve Vogt, a professor of astronomy and astrophysics at UC Santa Cruz. "We are now beginning to understand that nature seems to overwhelmingly prefer systems that have multiple planets with orbits of less than 100 days. This is quite unlike our own solar system, where there is nothing with an orbit inside that of Mercury. So our solar system is, in some sense, a bit of a freak and not the most typical kind of system that Nature cooks up." First author Mikko Tuomi of the University of Hertfordshire emphasized the importance of new techniques the team developed. "We pioneered new data modeling techniques by adding artificial signals to the data and testing our recovery of the signals with a variety of different approaches," Tuomi said. "This significantly improved our noise modeling techniques and increased our ability to find low-mass planets." Hugh Jones, also at the University of Hertfordshire, said the researchers chose Tau Ceti for this noise-modeling study because they had thought it contained no signals. "As it is so bright and similar to our Sun, it is an ideal benchmark system to test out our methods for the detection of small planets," Jones said. Over 800 planets have been discovered orbiting other worlds, but planets in orbit around the nearest Sun-like stars are particularly valuable. "Tau Ceti is one of our nearest cosmic neighbors and so bright that we may be able to study the atmospheres of these planets in the not-too-distant future. Planetary systems found around nearby stars close to our Sun indicate that these systems are common in our Milky Way galaxy," said James Jenkins of Universidad de Chile, a visiting fellow at the University of Hertfordshire. The international research team consists of Mikko Tuomi, Hugh Jones, John Barnes and David Pinfield (University of Hertfordshire); James Jenkins (University of Chile and University of Hertfordshire); Chris Tinney, Rob Wittenmyer, Jonathan Horner, Jeremy Bailey, Duncan Wright and Graeme Salter (University of New South Wales, Australia); Steve Vogt (UC Santa Cruz); Paul Butler (Carnegie Institution for Science); Simon O'Toole (Australian Astronomical Observatory); and Brad Carter (University of Southern Queensland).